Tigers and Transformers if you can imagine it, you can paint it. 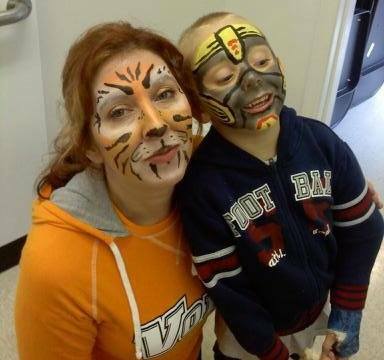 October is the time of year when even adults like to play “dress up.” Of course, kids like to let their imaginations go any time of year, and that’s what makes face painting such a great fund-raising activity. It is a wonderful way for kids to become their favorite comic book hero or sparkle like a Disney princess for the day . I taught myself the art of face painting during my time as editor of the Knoxville Focus Newspaper. We wanted to do something fun that the kids would enjoy during the Fountain City Easter Egg Hunt. We had tons of children line up, and I painted faces until everyone went home. It was so much fun. Now I won’t lie, I do have an art background but this isn’t the Sistine Chapel, it’s usually a first grader who wants to look like an action hero or sparkle with glitter. Kids are not critical. They just want to have fun with it. If you mess up, say “oops”, use a baby wipe and start over. At first I did designs that didn’t require much expertise, like smiley faces and bunny noses with whiskers, but as I became accustomed to the materials I began to try new things. I scoured the internet for ideas and came up with some of my own designs as well. Now I can make you look like Spiderman, SpongeBob or a tiger on the prowl. Many face painters use pancake theatre makeup, which I think requires more skill to “paint” the designs on and is more expensive. I personally enjoy using a combination of theatre makeup, face painting “crayons” and my favorite “Wet and Wild” eyeliner pencils in a wide array of colors. I also paint “tattoos” on arms and legs using a face painting markers that are a little less likely to rub off than the greasepaint. All of these are non-toxic, but be aware, they can stain clothing, much like any other makeup. If a child wipes his/her face on their shirt after it’s painted the greasepaint may stain, so it is always good to let the parents know upfront. My favorite method of removing greasepaint from clothing is to spritz it with peroxide before throwing it in the washer. It is cheap and effective. Peroxide also makes a great disinfectant to clean your “crayons” and brushes. I use disposable antibacterial wipes and sponges too. If you need a face painter at your next event give me a shout. You can email me at charminfoth@gmail.com, but if you are feeling adventurous, give it a try. It washes off.